Based in Laval, Qué., Malo Creations crafted this two-toned rose and white gold wedding band, ultimately winning in the category for personalized jewellery in this year’s JCK Jewelers’ Choice Awards. Two Québécois companies are among the winners of the 12th annual JCK Jewelers’ Choice Awards. The competition, which awards exceptional jewellery design, spans 21 main categories and a variety of price point-based subcategories. This year, more than 30 companies were celebrated, with some earning accolades under multiple headings. Montréal-based Noam Carver–CrownRing Bridal House took the prize for best bridal design under US$2500 for its 18-karat rose gold engagement ring, which is crown-set with 58 round diamonds and features a knife edge band. 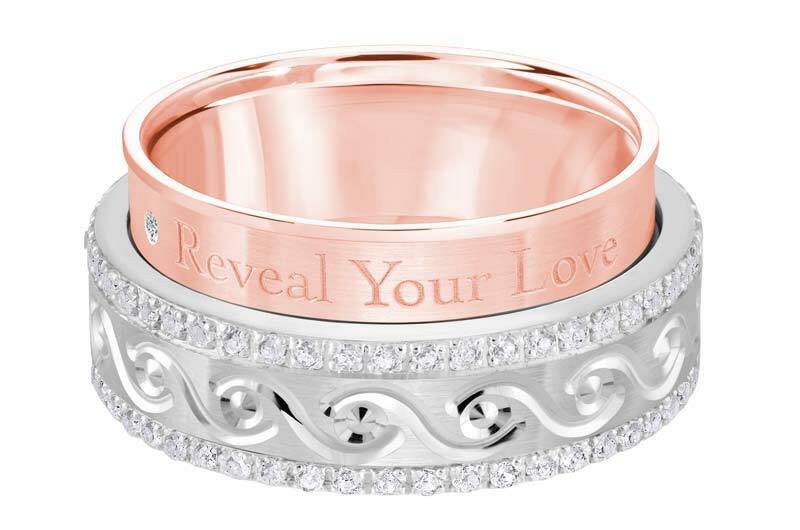 Meanwhile, Laval, Qué.’s Malo Creations was the sole winner in the personalized jewellery category for its two-toned rose and white gold wedding band, fitted with a patented mechanism to conceal an engraved message and set with diamonds (0.5 ctw). “We are honoured to win this award, as we strive to continuously break the mould in the wedding band industry,” said Stella Malo of the win. Winners and finalists will be published in JCK Magazine and will receive promotional materials for use at JCK Las Vegas. Bravo et tant mieux! Nous avons besoin de joailliers talentueux!